I realized that one of the things that is so appealing to me about Middle Eastern and Greek foods is the names. Tabbouleh. Falafel. Mujadarrah. Melomakarona. Tzatziki. Baklava. They’re just these great, exotic words that roll deliciously around your mouth. And, where many contemporary American recipes read something like Mini-Rack of Lamb with Nutty Beluga Lentils and Sauteed Garlic Spinach or Frisee and Endive Salad with Warm Brussel Sprouts and Toasted Pecans, these exotic sounding words are just that – words. One single word that conjures up a complete flavor profile and emotion all at once, rather than the “sum of parts” tactic that the long, ingredient-listing naming convention employs. I like that conciseness. I like hearing “baklava” and getting this complete association something along the lines of “honey flaky nutty crunchy yum pastry sunny sticky.” Not that the long names aren’t useful – you can build up the flavors and textures and even temperatures listed in your mind until you’ve reached your idea of the final product, and in some ways it allows more room for imagination. But I think overall I’m really more partial to the use of a single, perfect word. Falafel is a word that has many associations for me. I hear it and I see tiny window counters with brightly colored signs popping out of ancient cobbled walls. I feel a warm paper wrapper in my hands, heavy with food. I hear the crunch of lettuce and fried batter with a background of fast, loud interjections in a musical language that I don’t understand. And most importantly I taste warm, crispy chickpeas and bright, tangy tzatziki and crunchy, pickled turnips and soft, floury pita. Oh yum. Street falafel. Although I no longer live in a world where street falafel is available, thankfully falafel is very easy to make. If someone who has only been cooking for about a year can have staples, falafel is one of my staples. I.e. I’ve made it 3 times in the last 3 months: once for a dinner with Justin (that time I went all out and made Deb’s homemade pita which was SO good, if a bit labor intensive), once with Trevor for his dad and step-mother (for a dinner during which I drank one entire bottle of red wine from a juice tumbler to save it from certain death by way of the kitchen sink), and once today, when I suddenly decided that it was the only thing I could imagine eating. I only have a few tips for getting crispy-on-the-outside-but-soft-on-the-inside falafel. 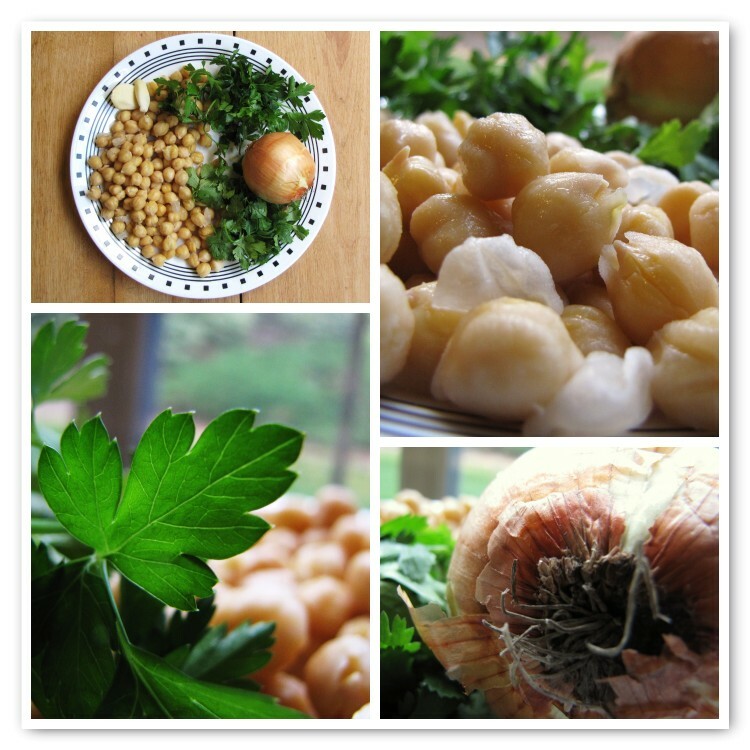 One, you want there to be some chunks in the falafel dough, so process the onions, garlic, herbs, and spices very finely before adding the chickpeas. Then you can pulse the mixture with the chickpeas just until the dough is mostly smooth with a few larger chickpeas pieces. Two, dry all of your ingredients off to the best of your ability before processing them. This will help the dough to stick together while it’s being fried. Three, you don’t need to fry these in 3 inches of oil to get crispy brown falafel, as the original recipe suggests. However, do make sure that the bottom of the frying pan is substantially covered. And four, the refrigeration step is optional. I’ve done it both ways, and while the falafel balls do stay together better if you refrigerate them first, if you’re starving and can’t wait the final product won’t suffer much if you just plop them in the pan as soon as they’re blended. Place the onions, garlic, parsley, cilantro, red pepper flakes, cumin, and salt in a food processor. Blend until finely minced. Add chickpeas, patted dry, to the food processor, and blend using short pulses, until the mixture is mostly smooth with some larger chickpea pieces. Turn dough out into a bowl and stir in baking powder and flour. You have added enough flour when the dough forms a ball without sticking to your hands. Cover dough and refrigerate for at least 1 hour. Cover bottom of large frying pan with oil and heat for 2-3 minutes over medium-high heat. Working in batches, form small balls of dough and drop into hot oil. Allow to fry for 3-4 minutes, then turn balls to expose fried part and continue frying. Keep frying until you have fried most of the falafel surface. Remove from pan and drain on paper towels. Serve warm in a pita stuffed with lettuce, tomatoes, pickled turnips, and tzatziki. I’m so glad I’m not the only person who finds food names so evocative. I can’t wait to try this recipe! I love falafel but have only tried to use a mix, which failed miserably. Definitely going to give this one a try. I personally think Greek words for food are the best, but that’s just because I am Greek and we think we are the best at everything. ;-) Kidding! This looks delicious! 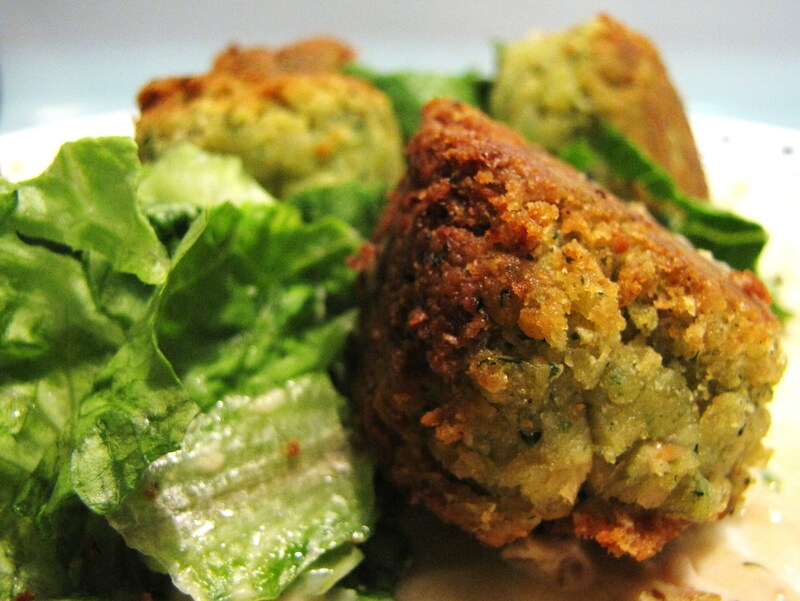 I’ve been trying to find a good falafel recipe…will have to try this one!